Feb 2019 is a quick estimate. Jan 2019 has undergone first revision. Nov 2018 has undergone final revision. Quick estimate of March 2019 will be available May 10, 2019. Source: mospi.gov.in (Ministry of Statistics and Program Implementation). The Ministry of Commerce and Industry reports a monthly index, "Index of Eight Core Industries (Base: 2011-12=100)", via press releases on the Press Information Bureau (pib.nic.in). "The Eight Core Industries comprise 40.27 per cent of the weight of items included in the Index of Industrial Production (IIP)." These are Coal, Crude Oil, Natural Gas, Refinery Products, Fertilizers, Steel, Cement, Electricity. Data for December 2018, January 2019 and February 2019 are provisional. Release of the index for March, 2019 will be on Tuesday, 30th April, 2019. According to the latest official data, purchases by various states via GeM touched Rs 9,209 crore in 2018-19 against Rs 7,947 crore by the Central government. States such as Uttar Pradesh, Maharashtra and Madhya Pradesh are among the largest buyers on the GeM platform.However, at 9.03 lakh, the number of orders placed by the Central government was higher than that of state governments (3.93 lakh) in 2018-19, suggesting that states ordered more high-value items. Enthused by the response, GeM is now aiming to catalyse public procurement worth `50,000 crore (in terms of value of transactions) through its platform in 2019-20 against `17,325 crore in 2018-19 and `5,885 crore in the previous fiscal.The products and services available on the GeM platform are typically commonly-used ones that various Central government ministries and departments used to purchase through the erstwhile Directorate General of Supplies and Disposals (DGS&D), before the 100-year-old government procurement arm was wound up. Suraj wrote: According to the latest official data, purchases by various states via GeM touched Rs 9,209 crore in 2018-19 against Rs 7,947 crore by the Central government. The graph and the statement appear contradictory. The graph plots Rs 9,209 crore against "Centre" (light blue) and Rs 7,947 crore against "States" (Dark blue). A case of mislabelling perhaps? Yes, CV sales are an extremely critical barometer of the investment cycle because it indicates that businesses are investing in capacity. Trivia: the economy last saw 800K CV sales back in 2011-12 . It took 6 full years for the activity to ramp up enough to exceed that number again in 2017-18 , and now hitting the million mark in 2018-19 . Yes the graph is wrong- they’ve swapped the figures for central and state for the most recent year while generating the graph . 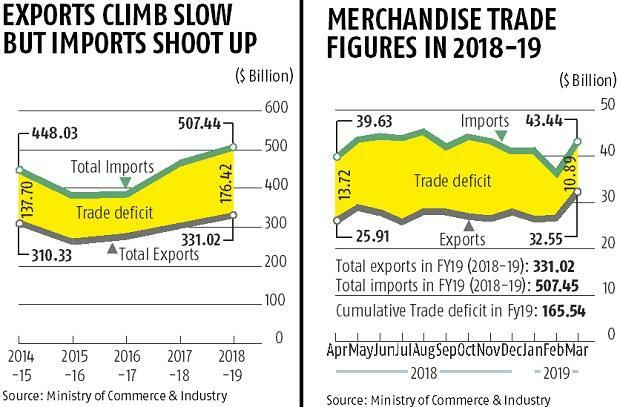 Total Indian exports touched $540 billion in 2018-19: Suresh Prabhu. India recorded its highest ever exports in the last fiscal accounting for $540 billion trade. This included $330 billion in terms of merchandise export and $210 billion in terms of services, noted union minister for commerce and civil aviation Minister Suresh Prabhu. The total deposits in bank accounts opened under the Jan Dhan scheme, which was launched about five years ago by the Modi-government, are set to cross Rs 1 lakh crore soon. The total balance in the Jan Dhan accounts, which has been steadily rising, was at Rs 97,665.66 crore as on April 3, as per the latest government data. The total number of Jan Dhan accounts have crossed 35.39 crore. The deposits stood at Rs 96,107.35 crore on March 27 and Rs 95,382.14 crore in the week before. More than 27.89 crore account holders have been issued the Rupay debit cards. The Pradhan Mantri Jan Dhan Yojana (PMJDY) was launched on August 28, 2014 with an aim to provide universal access to banking facilities to all households. Enthused by the success of the scheme, the government enhanced the accident insurance cover to Rs 2 lakh from Rs 1 lakh for new accounts opened after August 28, 2018. The overdraft limit was also doubled to Rs 10,000. The government also shifted the focus on accounts from ‘every household’ to ‘every unbanked adult’. Over 50 per cent of the Jan Dhan account holders are women, while nearly 59 per cent accounts are in rural and semi-urban areas. The objective of PMJDY is to ensure access to various financial services like availability of basic savings bank account, access to need based credit, remittances facility, insurance and pension to weaker sections and low income groups. The PMJDY also envisages channelling all government benefits to the beneficiary accounts and pushing the Direct Benefit Transfer (DBT) scheme of the central government. The Finance Ministry has asked CPSEs identified for strategic sale to immediately prepare a list of assets and initiate dialogue with potential investors and bidders so that their non-core assets can be monetised quickly. Such CPSEs will have an option to either hive-off non-core assets to a Special Purpose Vehicle (SPV) or transfer sale proceeds of non-core assets to an escrow account to ring-fence the realised amount from the rest of the business, an official said. The government has already identified about 35 CPSEs for strategic sale. These include Air India, Pawan Hans, BEML, Scooters India, Bharat Pumps Compressors, and Bhadrawati, Salem and Durgapur units of steel major SAIL. The other CPSEs for which approvals are in place for outright sale include Hindustan Fluorocarbon, Hindustan Newsprint, HLL Life Care, Central Electronics, Bridge & Roof India, Nagarnar Steel plant of NMDC and units of Cement Corporation of India and ITDC. The government has transferred Rs 29,000 crore debt of Air India, out of the total debt of Rs 55,000 crore of the airline, to AIAHL. Besides, proceeds from the sale of four subsidiaries — Air India Air Transport Services (AIATSL), Airline Allied Services (AASL), Air India Engineering Services Ltd (AIESL) and Hotel Corporation of India (HCI)– too would be transferred to AIAHL. Also, non-core assets – painting and artefacts – as well as other non-operational assets of the national carrier too will be transferred to the SPV. The finance ministry is looking at the innovative Real Estate Investment Trusts (REITs) model for sale of land assets of CPSEs and also those which are classified as ‘enemy property’ by the government. REITs, which are regulated by the Sebi, are instruments for investments in real estate. Under this model of securitisation, the land assets will be transferred to a trust, providing investment opportunity for institutional investors. The finance ministry is looking at the REITs model along with other modes like leasing or outright sale of land assets for monetising non-core assets of central public sector enterprises (CPSEs) which have been identified for strategic disinvestment, an official said. The ministry is also considering the REITs model for monetisation of immovable enemy property. Although market regulator Sebi had notified REITs guidelines in 2014, the market for this instrument for investment in real estate is yet to pick up.